Are you one of those people who forgets about birthdays until the day before? If so, what do you do for buying that person a present? Maybe you rush around in a frenzy and buy the first "cool" item you see. However, that may not be the best idea if your friend doesn't share the same views as you of what is "cool". Well, now you can fear disappointment no more! I've compiled a handy little guide of some of the greatest generic presents to get your friend. You see, everyone will be finding all the "unique" gifts, but yours is definitely the best because they didn't expect it to be so generic. *Note that some of these may seem pretty unique, but the category they come from is pretty generic. To start off with, you need to buy a birthday card. Otherwise, how will your friend know it's from you? What do you mean he could just ask? Don't be silly, psh. 1. The Best Friend Card is probably your best choice for, well... your best friend. Let everyone know that YOU and your friend are the bestest ones ever. It also features a cute design of Aishas on the front with some bright colours. What better way can you say "Happy Birthday to my best friend!" than with this card? 2. Look at the cake on this one! Unlike the Happy Birthday Card, this one looks good enough to eat! You'll be the envy of all the party guests with THIS cool birthday card. 3. This card is probably the most basic of birthday cards. It features a rather generic-looking, (boring, in my opinion), cake on the front. The orange and blue colours on the card also might remind your friend of summer, so this card would be perfect for a summer birthday! So now you have your birthday card, but wait, where to put it? Before you even buy a present, consider what type of box you will put the present in. Here are some suggestions for you to use. 1. "Isn't that a bit too plain?" you may be wondering. Have some creativity! Take this boring old box and whatever items you want to decorate it with. With adult supervision, glue on buttons or fake feathers or even just colour it with some Snuffly Markers. Your gift box is boring no more and will be a great hit at the party. You can really say that your present is unique with a decorated Gift Box. 2. Just look at the swirls on this one! This box is sure to be looked at in detail once the present inside has been unwrapped. The designs on this one are simply breathtakingly beautiful. Despite not being decorated much otherwise, this box exudes an impressive aura. 3. Wowee, those sparkles and stars are amazing. This box will be sure to awe other party guests including your friend. The gold shines in the sunlight too, so maybe giving your friend a pair of sunglasses with this box wouldn't be a bad idea. The next set of items can be used as alternatives to gift boxes. Flowers are a great way to celebrate any occasion including birthday parties, so why not buy some? Your local botanist will surely suggest the freshest, best-looking flowers of these types to you. 1. This majestic flower almost seems royal. The frills of this flower will definitely impress all the other party guests and your friend. The colouring, like the colours on the Happy Birthday Card, resemble summer. This flower matched with that card would probably be the best gift for a summer birthday party! 2. Brr, these flowers almost look cold to the touch! Remember how I was just talking about summer birthdays? Well, these flowers are best for the winter birthdays! The clouds that float around this bouquet are also really cute and somewhat mesmerizing. 3. Alright, so maybe these aren't the best choice, but they're still flowers, right? If you're running really late and the flower shop just ran out of all the good flowers, maybe you can pick these ones up. They also come with a neat-looking vase to make up for their simplicity. 4. Now THESE sure are bright! These flowers are perfect for that rainbow-colour-loving friend who just HAS to be the most colourful person in the block. They also smell good and make a great perfume scent. Flowers may smell nice, but they certainly aren't all edible! The next set of gifts are great for the glutton: chocolates! Obviously your first choice would be to find their species' chocolate (Aisha chocolate, Peophin chocolate, etc) but these ideas are for any pet. 1. These small chocolates are perfect for snacking on and come in a neat storage container. This container is also quite easy to camouflage in with any other items around the house, so your friend can hide her chocolates. 2. Yum, now these are the ultimate sweet treat! Can you not decide between gum drops and chocolate? No longer will you have to decide as this present covers both of those aspects. 3. Perhaps a bit simple, these chocolates are a basic way to satisfy your hungry friend. They come in an assorted pack so your friend can choose which one he likes best. There are also a lot of chocolates in each package so they're great for sharing! 4. Although these chocolates come in smaller packages, their assortment of flavours far surpasses the assortment of flavours of Chocolates. This box also comes with a fancy wrapping so you may not even need to buy a gift box to wrap it in! Do you have a friend who just ADORES plushies and fills her room with them? Well, there's no better time to buy a birthday-related plushie than now! Even if your friend isn't a plushie fanatic, I'm sure she'll adore these ones. 1. The hat on this one just screams "party!". However, since there is a 9 on the hat, you can always decorate this plushie by sewing on a badge over that 9 to make your gift unique. 2. Despite the name on this plushie, he doesn't actually have any 10s written on him. In fact, this plushie might be your best choice as no extra work is needed to cover up that dreaded number. He's purple and starry too, what's not to love? 3. And again another birthday plushie with a 9 on his hat. The eyes on this lupe will be sure to melt your friend's heart. He really just wants a hug; go on, hug him! Just make sure you give him to your friend on her birthday instead of keeping him. 4. Here we have our last birthday plushie. This one is especially great for the rushed buyer. Why? If you can't find this plushie in stock, simply buy a Green Scorchio Plushie and stick a little cone on his head. There you go, your own birthday plushie! If you're stuck looking for clothing or accessories for you friend, your shopping trip might be a disaster. Try looking for some of these items which are perfect for many different occasions and outfits. 1. At first glance, you may wonder why I'm suggesting this headscarf. Despite being semi-unloved, this scarf is attractive on both genders and almost all species. It matches many different outfits and looks stylish too. 2. And now we come upon some of Jazan's makeup. This guyliner is quite fitting for both genders as it adds a subtle desert theme to your friend's look. Maybe your friend just likes makeup, or maybe your friend is a Jazan fanatic. Either way, this guyliner is perfect for them! 3. This elusive walking stick makes the best gift for a friend who loves hiking in mountains or just adventuring around his home. The carvings on this stick are mystical but very smooth and well-done. It also compliments many outfits that your friend might have. And last but not least, maybe your friend has really wanted a petpet. 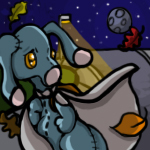 Some petpets are harmful despite their cute appearances, so watch out while picking! Here are some docile suggestions. *Warning, remember to put holes in your gift box if you are getting your friend a petpet! 1. The Mauket is one of the newer petpet species but is definitely a great petpet choice for a friend. This petpet is calm and will gladly sit on a pillow or cushion most of the day. However, if your friend wants to play, the Mauket will happily oblige and have a great time. 2. The Anubis is much like the Mauket except it's much more playful. This canine petpet is also very loyal and will follow you around all day if you let it. This petpet also comes in many different colours including some like the colourful Disco, the gruff-looking Tyrannian or the pompous Royal. 3. The Hermiteese is our last petpet choice here. It's a petpet with a bit darker colours, but it's still very friendly and is a good companion. Although it can't be painted many colours, the ones available will satisfy most types of people. So there you have it, your handy guide to last-minute birthday shopping! Now you can relax at home, knowing that you have the best gift for your friend. With this knowledge you can- wait, pardon? The party isn't until next week? Well, at least you're ready now, right? I hope you found this guide helpful at least. A simple guide for those who want to spread kindness to other users! "That's it! I've had it with you." Keion's yellow button eyes shone with the light of anger. "I'm leaving!" "I told you to come on!" repeated Bigsby, getting a bit annoyed. "Bart! You're being so apathetic! You should take hold of your life and do something with it!" She heard the guard stand and say, "Queen Nabile! King Altador! Captain Brynneth! Ogrin Master! And..."